Becky Lynch didn’t wait until SmackDown Live to announce who she’d be facing at WrestleMania after winning the Royal Rumble — she showed up on Raw to do it. It all went down after Ronda Rousey’s open challenge win on Raw. Becky Lynch came out to announce Rousey would be her opponent at WrestleMania and that it was an easy choice for her to make. 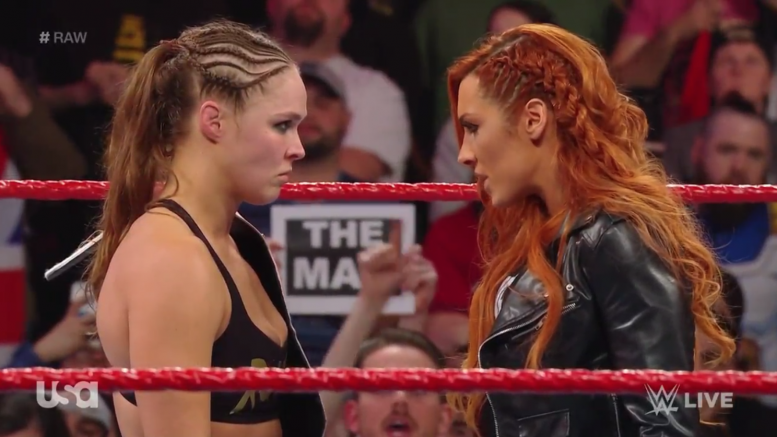 In case you’ve been living under a rock the past few months … this match was initially supposed to take place back at Survivor Series, but an injury to Becky Lynch forced a last minute change and Ronda faced Charlotte instead. Are you one of those fans? Let us know in the comments!